Padre Miguel d’Escoto Brockmann died yesterday aged 84 after a relapse following successful treatment for a stroke earlier this year. His death deprives us of the leadership and guidance of one of the world’s great moral leaders, a tireless advocate of non-violence and peace. For everyone who knew him personally, he was a determined, loving human presence, the very embodiment of solidarity and moral charity. Miguel had tremendous humility and willingness to serve. He was a great educator. He taught those around him not to be afraid of confronting and addressing their own contradictions, as he did his own, with rigor, honesty, sincerity and humor. Padre Miguel was a Latin American prophet of peace inspired by Sandino and Bolivar, but also by Dorothy Day, Gandhi and Martin Luther King. An uncompromising anti-imperialist, he passionately and unapologetically defended expressions of non-alignment as diverse as the Cuban Revolution, the Libyan Jamahiriya and the Islamic Revolution of Iran. Among many other remarkable facets, like his accomplished contributions to moral philosophy and liberation theology, Miguel was a qualified civil engineer. He was far from being a mere dreamer, as his imperialist antagonists so often labeled him. Miguel was a man of action who fulfilled his religious vocation through a lifetime of service as a Maryknoll priest. Following his ordination in 1962, he accompanied impoverished families in the marginal barrios of Santiago de Chile before returning ten years later to Nicaragua where he put his civil engineering studies to use building over 600 houses in an innovative rebuilding program, in the university city of León, to rehouse families left homeless by the devastating 1972 Managua earthquake. During those same years he became a leading advocate of liberation theology and put his beliefs into action, promoting active non-violent resistance to the Somoza dictatorship in Nicaragua. By the time the Sandinista People’s Revolution finally defeated Anastasio Somoza on July 19th 1979, Miguel d’Escoto’s moral stature and authority were recognized internationally. 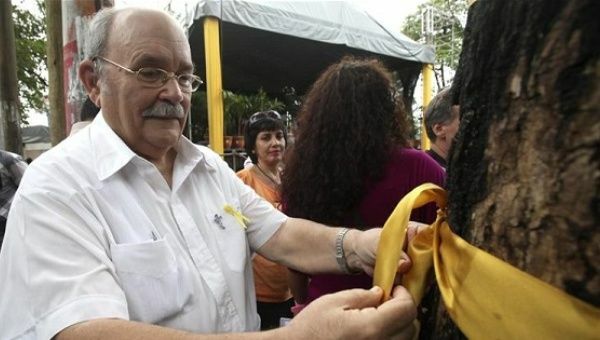 He was an obvious choice to serve as Nicaragua’s Foreign Minister, a post he held until 1990, all through the years of the US government funded terror war. “it would have been to betray my people, betray their legitimate rights and aspirations…it would have been to betray the People’s Sandinista Revolution, betray all our heroes and martyrs, Daniel and all our comrades engaged in the struggle”. Typically, Padre Miguel expressed that identification both through physical action and through decisive and highly accomplished moral and intellectual action. Physically, from July 7th to August 6th 1985, the 40th anniversary of the Hiroshima atomic bomb, he held a month long fast publicising Nicaragua’s call for peace and an end to the US government’s terrorist war. In February 1986, he organized a Walk for Peace of over 300km in 15 days accompanying 100 christian activists between Jalapa on Nicaragua’s Honduran border and Managua. All along the route, still today, people remember receiving the exhausted marchers with Miguel among them and helping him, tending to his blistered and bloody feet. They remember too the inspiring prayers and reflections of Miguel and his fellow marchers each day and how the church hierarchy closed their churches to the marchers. Aldo Lacayo’s remarks hint at the fundamental role the Esquipulas peace process played in forming the culture now embodied in the Community of Latin American and Caribbean States. Key components were : no US presence in the process, a formal institutional structure and also a commitment to both peace and progress towards integration. Miguel d’Escoto and his team were conscious inheritors of not just Sandino but Bolívar too. Their realist vision projected forward a practical template for those ideas to be realized later by Fidel and Hugo Chávez. Nicaragua’s revolution was a crucial step helping that vision come about. But for Nicaragua to participate in the emancipation led by Comandante Chavez, the Sandinista Front for National Liberation had to survive 17 years of political opposition and internal splits. 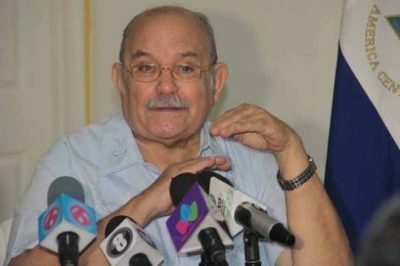 During that time, Miguel D’Escoto was one of several key figures supporting Daniel Ortega’s leadership through one gratuitous attack and setback after another. His spiritual authority and intellectual rigor reinforced Daniel Ortega’s defense of core Sandinista principles while exposing the superficiality and opportunism of Ortega’s detractors. Throughout that period, Padre Miguel never stopped doing diplomacy, building bridges around the world based on the ideals of peace, cooperation and non-alignment. So his election as President of the 63rd UN General Assembly was perfectly natural and he made his mark immediately in the context of the economic crisis of 2008 and its environmental corollary, the breakdown of the binding Kyoto protocol. Padre Miguel brought together specialists in economics and other disciplines to formulate proposals to reform the international financial system. US and allied government opposition vetoed that initiative. Similarly, that year 2009 saw the fatal betrayal by Barack Obama of his government’s commitment to a new relationship with Latin America and the Caribbean. After the Honduran oligarchy ousted Manuel Zelaya in June 2009, Padre Miguel accompanied Zelaya in a daring but very dangerous and in the end unsuccessful attempt to land at Tegucigalpa’s airport.